Jason can not remember anything before the bus ride. He has been taken to Camp Half-Blood, a camp not visible to normal humans. A camp full of half-human, half-god. They are children of the Gods, and so are Jason, son of Zeus, Leo, son of Hephaestus, and Piper, daughter of Aphrodite. They find out Hera has been trapped in a cage by Enceladus, the king of Giants. Hera is the one responsible for taking Jason’s memory. It was a way to send Jason and his friends onto a quest to save Hera. On their journey, they encounter many challenges. Storm Spirits, angry Gods, a family of giants, they even destroy Enceladus! They manage to find Jason’s long-lost sister, Thalia, who is now part of the Artemis Hunters. It takes a long while to find Hero because of the guardians, but they finally find her. Do they save Hera or not, read the book yourself! I found this book interesting. It had a good start, Jason losing his memories and has no idea where he is and what he is supposed to do. My favorite parts of the book are when Zeus actually helps Jason. For example, the part where Jason’s friends were turned to gold. Jason was the only one against King Midas and his gold touch. His fury passed through for blood and he asked Zeus for his help. This is one of the few times (one out of two) Zeus helps his son. On the other side, I dislike how the author of the book uses cliche writing. When Leo is surrounded by giants, Riordan writes that Leo saw his friends “out the corner of his eye” hanging, about to be devoured. A few pages later, he uses the same thing, “out the corner of his eye”. I think the age groups that would best enjoy this novel would be 11-13 year olds. I rate eight out of ten. 1. Who took Jason’s memories? 1a. The Goddess Hera took Jason’s memories. 2. Why is Piper upset about the Mist? 2a. Piper is upset about the Mist because it created fake memories about Piper and Jason dating. 3. Who takes Beckendorf’s dragon back to Camp Half-Blood? 3a. 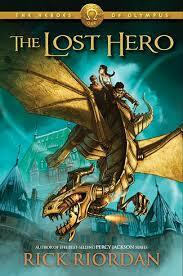 Jason’s best friend, Leo, took Beckendorf’s dragon, Festus, back to Camp Half-Blood. 4. Why is Piper scared to unsheathe her dagger? 4a. Piper is scared to unsheathe her dagger because she is scared she will see her reflection as a traitor on the dagger. 5. What species is Coach Hedge? 5a. Coach Hedge is a satyr. 6. What is the God of Snow’s name? 6a. The God of Snow’s name is Boreas. 7. Why did the Jason think the giant was Piper? 7a. Jason thought the giant was Piper because the giant changed his voice to Piper’s voice. 8. What happened to Festus? 8a. Festus was blown up by Midas’ security. 9. What can Midas do? 9a. Midas can turn people into gold. 10a. They flew 500 miles without Festus by forcing the storm spirits to fly them. 11a. Thalia is Jason’s sister. 12. Does Jason end up meeting his sister, Thalia? 12a. Yes, he meets Thalia. 13. Who helps Piper through a dream? 13a. Aphrodite helps Piper through a dream. 14. What did Enceladus do to his father? 14a. Enceladus chopped up his father into pieces. 15. Does Jason end up finding Percy Jackson? 15a. No, Jason does not find Percy Jackson.